As a “seal of approval” from industry peers recognizing excellence in health data processing and transactions, HNAP is ideal for organizations that manage and exchange protected health information (PHI). 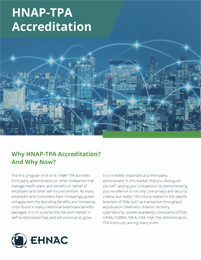 HNAP-accreditation indicates that you exceed industry-established standards and comply with HIPAA regulations in areas such as privacy and confidentiality measures, level-of-service and escalation procedures, transaction response times, and systems availability. HNAP assesses security infrastructure and data integrity measures including disaster recovery; business continuity; contingency plans; and intrusion detection and response. The program also evaluates transaction processing efficiency; ability to comply with generally-accepted, industry-standard data formats; and audit trail capabilities. Reduce risk to PHI and operations through the demonstration of a risk management program with effective controls that appropriately minimize threats. Prepare your organization for third party audits including HIPAA/HITECH compliance audits that are now being conducted for the Office of Civil Rights (OCR); trading partner audits (some payers require EHNAC accreditation as a condition of processing their transactions); and state compliance (EHNAC accreditation is required for processing healthcare transactions in the states of Maryland and New Jersey). Enhance trust for your customers, trading partners, and other stakeholders. To further accommodate an expanding field, EHNAC offers several additional subcategories of HNAP accreditation with criteria more specific to the realities of a range of market niches. HNAP EHN, the primary EHNAC accreditation program, is intended for companies or organizations whose electronic health networks perform claims clearinghouse or EDI gateway functions. HNAP TPA, the first program of its kind, accredits third-party administrators or other companies that manage health plans and benefits on behalf of employers and other self-insured entities. HNAP Payer is for payer-owned electronic health networks and expands on the core HNAP accreditation criteria to assure all clearinghouse functions and organizational standards are world-class. Payer-specific and expanded criteria regarding security against intrusion and protection of confidential PHI are also included. HNAP Medical Biller accredits companies that handle sensitive data as part of their coding, billing and other services on behalf of provider organizations including physician practices and hospitals, as well as health systems, labs and other types of healthcare organizations. To begin the application process for any of these programs, please complete the application form through our website. Program criteria are located on the criteria page. Also, are you looking for hands-on support to help you through the pre-assessment steps, readiness planning process and more? Learn about EHNAC’s Consulting and Advisory Services which have been designed to support the Healthcare Networks Accreditation Programs. – Thomas A. Kish, CEO, EDI Services, Quadax, Inc.